First of all, I must admit I know nothing about sports. NOTHING! But I do know that people who DO know about sports have been talking about basketball lately. 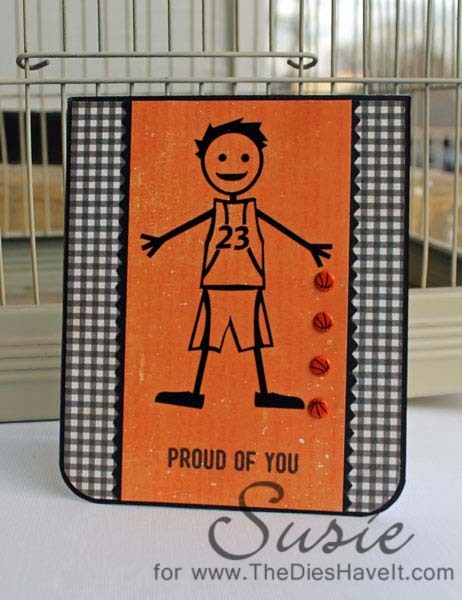 So here is a cute little card with four sweet basketball brads from the mini ball collection from Eyelet Outlet in a vertical row. Isn't your eye immediately drawn to them on this card? For my project I used papers from the Authentique Apothecary line and a cut file from the Silhouette store. Cutting my little man from vinyl is wonderful because it is self adhesive. This was a pretty simple card. I even typed the sentiment. Easy peasy!! But it's those little basketballs that are the star of this show. 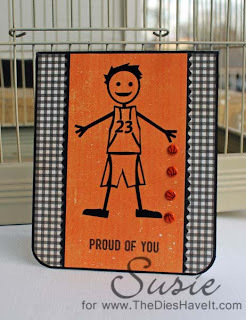 If you stop by tomorrow, I'll show you another card I did for Eyelet Outlet. And be sure to check out their website. They have lots of new and super fun product for you. PS: The winner of the Club CR8 April E-book is Patty from Hap Scrappy. Patty, be sure to contact me so I can get your copy to you. Even if you didn't win, don't forget you can order the new Club CR8 April E-book here. 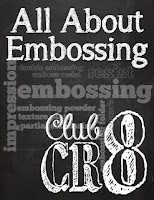 It's all about embossing and you will want a copy!! Cute card and congrats to Patty!